Georgetown resident Jameson Pelkey will become athletic director at St. John’s Prep on July 1, when he fills a position held by Jim O’Leary since 1999. 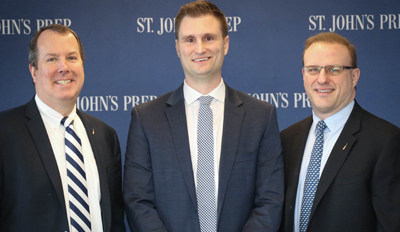 St. John’s Prep Principal and Associate Head of School Keith A. Crowley, Ph.D. made the announcement Tuesday morning with invited media in attendance. A member of the St. John’s Prep Athletics Department since 2006, Pelkey currently serves as assistant athletic director for grades 6 through 8. “Jameson has played an integral part in our athletics program since he first came to St. John’s,” said Dr. Crowley. “His work ethic and his attention to the holistic development of our student-athletes are big assets. His experience as an administrator and coach, the positive relationships he’s built within the Prep community and with other schools, and his commitment to our mission and values as a Xaverian Brothers Sponsored School, make him a natural fit to become the Prep’s next athletic director. This is an important role at St. John’s, and I have every confidence in Jameson’s ability to lead our program forward.” More photos on SmugMug. Pelkey will be responsible for overseeing the school’s interscholastic athletics program across grades 6 through 12. St. John’s offers 22 sports at the developmental through varsity level with approximately 85 percent of students participating. He will lead a program with a 112-year tradition of success on the field, the ice, the hardcourt, the track, and in the pool. The Prep has won the Boston Globe Nason Award for program-wide athletic excellence 31 times. Pelkey came to St. John’s in August 2006 as an assistant varsity football coach, a role in which he focused on developing skill, discipline, sportsmanship and teamwork among student-athletes. He joined the athletics department as a staff assistant in 2007, and his responsibilities grew to include scheduling interscholastic events; coordinating practice times, facilities and transportation; assisting in the selection of coaches and staff; supervising home events; managing team rosters and communication with families; and ensuring compliance with MIAA regulations and guidelines. He was named assistant athletic director for grades 6, 7 and 8 in 2015. A native of Barre, Vt., Pelkey holds a B.S. in sports management and an M.S. in athletic administration, both from Endicott. He is certified by the National Interscholastic Athletic Administrators Association as an athletic administrator (C.A.A.). He and his wife, Kelly, have lived in Georgetown since 2012. Jim O’Leary came to St. John’s as a member of the freshman football coaching staff in 1977 while still teaching at North Reading High and scouting for the University of New Hampshire football program. After a season as a varsity position coach and five years as defensive coordinator, he became the Eagles head coach in 1984 and remained through the 2013 campaign, posting a career record of 207-106-2 (.660 winning percentage) and serving as the architect of two state championships. O’Leary played a key role for the Massachusetts Interscholastic Athletic Association Tournament Management Committee, which created new postseason tournament seeding and divisional alignment policies endorsed by the MIAA Board of Directors earlier this year. O’Leary will stay on at St. John’s as a special assistant to the Principal, remaining as the school’s main representative with the MIAA and continuing to act as a game administrator. Pelkey will become the school’s eighth athletic director since World War II. In 1964, the late Paul “Buster” DiVincenzo ’50 became the first layman to serve as the Prep’s athletic director, followed by Fred Glatz (1975 to 1999), for whom the Prep’s Glatz Field at Cronin Memorial Stadium was named in 2017. O’Leary (2015), Glatz (1989) and DiVincenzo '50 (1985) are all members of the St. John’s Prep Athletic Hall of Fame.